Any parent who has lived with a toddler or preschooler knows the pain of hearing a child’s endless cough, daytime, nighttime, all the time... It seems as if the cough never clears up in a day or two, or after a cold, but may last for weeks. Even if it does clear up, it always seems to return without much warning, and can be more stubborn than your 4 year old about eating vegetables! 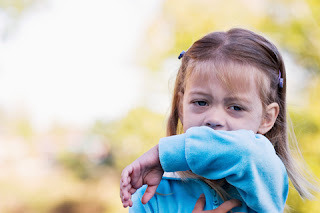 If you are wondering why cough medications can't stop your child's cough, or for that matter, why inhalers for "asthma", another 10 days of antibiotics, and/or allergy medications are all not working, then continue reading. Have you dragged your child all over town to see yet another specialist to find out why they just keep coughing? Here is what I explain to all families who come to see me about cough. Cough is an involuntary reflex, or protective mechanism the body has to get unwanted particles or irritants out of our airway. So if dust got into our windpipe, or a droplet of liquid goes into the airway accidentally while your child was drinking and trying to talk at the same time, or the phlegm that he/she gets with a viral illness... all of these things can make our children cough. While most children are thankfully not intermittently or continuously inhaling dust, or running around drinking with their head tilted while talking at the same time, the one frustrating thing about young children is the fact that they get 7-10 viral upper respiratory track illnesses, or colds every year. Each one of these “colds” last 7-10 days, and so pretty quickly, you can have a child with cold symptoms for a third of the year! NUMBER 3: Post-viral neurogenic cough or habitual throat-clearing. Whatever the reason was, your child started out having a bad cold and coughed due to being sick. Even after the fever and acute illness goes away after 7-10 days, their throat and voice box somehow stays irritated and they continue to cough. At some point, your child may not even realize that he/she is "coughing". Often these are children who are throat-clearing and not really coughing (more often in short annoying bursts, as often as every few minutes). If you no longer hear them "coughing" during sleep, but only when they are awake, then this is likely what your child has. These children often show no other signs of illness or discomfort. It's a difficult diagnosis to make and usually after all other reasons have been rules out. I often offer strategies to families to help break these habits such as creating a game (older than 3 or 4 years of age can do this) whereby a kitchen timer is used to help suppress the urge to "cough" starting from 30 seconds and working up to 5 minute intervals. School aged children who do not appear ill but have a “dry” throat clearing do very well with this exercise. Another option is when they get into a coughing fit, to distract them with chewing gum, having them count backwards from 20, hopefully distracting them from this habit. NUMBER 2: Chronic Rhinosinusitis (CRS). Your child may have developed true chronic rhinosinusitis which means inflammation from thickening of the lining inside their sinus cavities and their sinus "plumbing" is clogged up. Chronic sinus inflammation is NOT a bacterial infection so antibiotics will not make it go away completely, even if it seems to decrease the cough temporarily. This usually occurs in children older than 4, especially if they have underlying test proven allergies to common aero-allergens like trees, pollen, grass, dust-mites, and other environmental allergens. Sometimes this is bad luck and develops after your child has experienced a terrible viral illness, such that the mucous membranes inside the nasal passages were so swollen that the natural drainage points that lead each sinus cavity into the nasal passage are blocked, which then leads to the inflammation inside the sinus. Since there is a built-in mechanism called the "sinopulmonary reflex", children who have inflamed sinus mucous membrane lining will likely continue to cough until the nasal passage and sinus mucous membranes are no longer swollen and healthy again. The only way to truly know if your child has CRS is for him/her to get a CT scan, a special imaging of their sinus cavities which can involve some radiation exposure. These children tend to complain of a stuffy nose all the time along with the cough, and can't blow anything out of their nose even if they try. Mothers always tell me that their child is stuffy and can’t breathe well, leading to snoring, fatigue, sometimes headaches. NUMBER 1: The Milk and Cookie Disease (MCD). Your child is coughing because day after day, night after night, their larynx (voicebox) is bombarded with stomach content backwash (gastroesophageal reflux and laryngopharyngeal reflux) coming up to and irritating the voicebox. The voicebox which enables humans to talk is also designed to "cough" as a way to keep unwanted materials from entering our airway. If it did not protect itself by coughing, then we would aspirate and possibly get pneumonia. Find out how your child can live and eat in "A Healthier Wei " and fight the Milk and Cookie Disease, by minimizing dairy and sugar in the evenings and then his/her voicebox can rest and not be in "fighting" mode all the time. I have met thousands of children who have chronic cough not because they are sick, but because they were eating a diet or drinking beverages containing too much dairy and sugar, as well as possibly greasy foods and processed foods. All these items increase likelihood of reflux or backwash and assault on the larynx. If the voicebox is always on “alert” and ready to “fight” and protect the body, then it really can’t relax and rest. I believe that when this happens chronically from MCD, and let’s not forget those 7-10 colds and how they also lead to an irritated overreactive cough, then together, this child has no chance and probably will cough, A LOT! By making changes in diet and dietary habits in children, we can decrease the chance of stomach backwash coming up to irritate the voicebox and cause cough, then hopefully your child only coughs when it is truly because of a cold. Don’t take my word for it, try “A Healthier Wei ”. You will likely notice at least much less coughing, and coughing ending much sooner after a cold. I also ask parents to stop dairy/milk for up to 1 week during the time their child is sick. This is when digestion is not at its best, and things get sour and gross in the stomach increasing chance for reflux and more cough.